It is important to understand that Mercury rules the reasoning and conscious mind that forms conclusions. 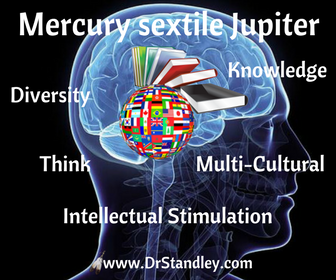 Mercury is intellectual, enjoys learning, teaches and is communicative. Jupiter is lucky, adventurous and abundant. It is also very benevolent, generous and philanthropic. Jupiter also rules religion and higher education. So you see, both Mercury and Jupiter are all about learning and teaching. Mercury sextile Jupiter bestows an optimistic approach to Life. It can make you happy-go-lucky in your mindset, which means that if you make up your mind that you are lucky, then you will in fact, be lucky. Whatever the mind dwells on with this aspect, so shall it be. Whatever the emotions and thoughts insist on entertaining, then Life will flow in that direction. This is an education, learning and intellectual input type of aspect. Become hyper-aware of what you choose as input into your brain. Higher-learning and multi-cultural studies are heightened. Read more in my Astrology Aspects eBook - click the graphic below!